The work at Que Stien is so delicate with beautiful and intricate borders and detailed illustrations of botanicals. Great colors… it’s what I remember most about this booth. I also remember the fantastic quality and crispness of printing. Gorgeous stuff. Dinah, prices vary based on quantity and components ordered. I found Que Stien through this website and am so happy I did. Our wedding invitations were perfect, although it was so difficult to choose only one design from their beautiful collection. The customer service was impeccable – very friendly and willing to advise on all conceivable details of phrasing and assembling. 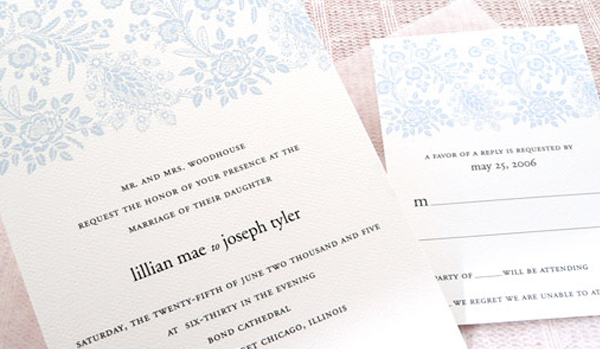 For such quality invitations and personal attention, the pricing was very reasonable. I highly recommend Que Stien.